Dash (Batavia’s Graveyard, 2001, etc.) provides a colorful tour of early-20th-century New York in this Police Gazette–style tale of the only New York cop ever executed for murder. The killing of well-known gambler Herman Rosenthal took place in 1912 outside a midtown hotel in “Satan’s Circus,” the street name for midtown Manhattan’s wide-open Tenderloin district. The author has done a herculean job of ferreting out the comings and goings of a menagerie of hookers and hoodlums, introducing us to folks with names like Gyp the Blood, Lefty Louie and Bald Jack Rose. He also provides some eye-opening evidence on the corruption that permeated the city, which served as the personal playground of Tammany Hall bosses, gambling czars like Arnold Rothstein and policemen who with impunity neatly carved up millions in bribes and graft money. Dash delivers their stories in a clear if rather wooden prose offset by anecdotes and nuggets of trivia. (For instance, the fact that assistant police commissioner Winfield Sheehan later went to Hollywood and discovered Rita Hayworth and John Wayne.) 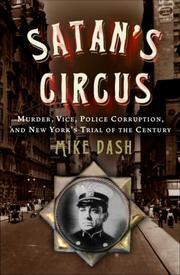 The author’s chief problem lies in the character of his protagonist, corrupt police lieutenant Charley Becker. Early on in his career, Becker had a well-publicized run-in with young writer Stephen Crane over his false arrest of a prostitute. At the time of his trial, he admitted to massive bribe-taking during his years on the police force. Generating sympathy for this dour, stone-faced brute would have been a tall order in any case, but Dash fails to provide more than a grainy out-of-focus portrait. Nor, for that matter, does he offer a verdict on whether Becker was actually guilty of the celebrated murder or not. Copious notes and research buttress the text, but photographs of at least some of the colorful heroes and villains who roam its pages would have livened things up considerably. A worthwhile history lesson, less compelling as a personal crime drama.